Foliage Type: Arching, vase-shaped clump of fronds. 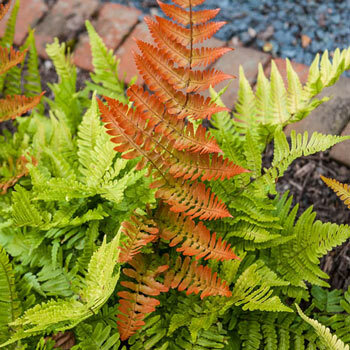 New fronds unfurl in orange, red, and copper color before transitioning to deep green for the summer. Soil Requirements: Well-drained, humus enriched, moisture retentive soil. Pruning: Cut back old parts following new growth in spring. Additional Information: Do not allow soil to dry out. Keep in areas that are protected from strong winds to protect the fronds.